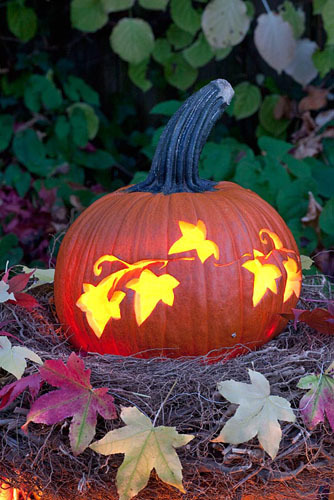 Halloween is just around the corner, so it’s time to give the garden a spooky makeover by carving a pumpkin. Large, orange pumpkins are probably the easiest to carve and offer a large surface for your designs, but there’s no reason why other shapes or colour of pumpkins and squash can’t be used. Nobody knows for sure where the tradition of carving pumpkins originates from, although some believe it started in Ireland in the 19th century, when turnips and beets were given grotesque faces during the Gaelic festival of Samhain. Irish immigrants took the tradition with them to the USA, where pumpkins were originally carved in order to celebrate the harvest season. When it comes to cutting pumpkins, people often stick to a simple, monstrous face. Yet there’s no reason why you can’t be more ambitious. It’s possible to create all sorts of designs from the outline of a haunted house to a scary spider, or from a flying witch to a floral pattern. The key is put a design down on paper, then tape it to the outside of the pumpkin. Prick holes around the outline, remove the paper and carve out the design following the dots. Now all you have to do is place a tea light inside and display your masterpiece in a prominent place. This entry was posted in Halloween, Seasonal on September 23, 2014 by gapadmin.